Developers reduced the pace of new launches in H1 2016 in the face of mounting inventory as demand continues to be frail. Weighted average prices of apartments have been plateauing since the start of the year, as sales and absorption had taken a big hit post the torrential floods in December 2015. Buyers in the city deterred their home buying decisions, in anticipation of state election results declared in May. South and West Chennai garnered healthy housing demand owing to infrastructure upgrades, presence of IT hubs, manufacturing sector & educational institutions. 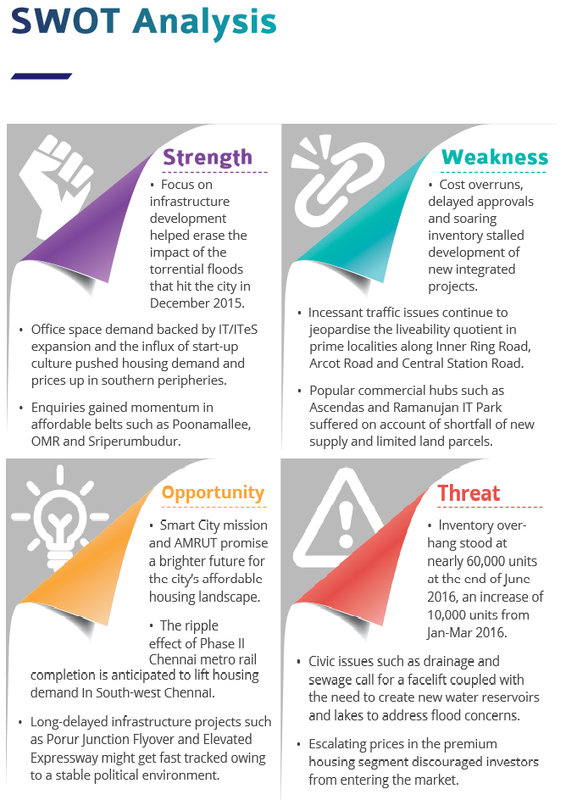 Affordable housing inventory led Arcot Road to top the capital charts with a five percent growth Q-o-Q. Choolaimedu followed suit with a three percent rise. 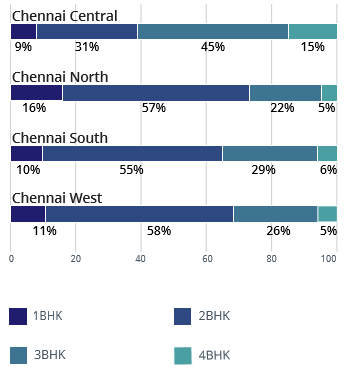 North-west and South Chennai witnessed healthy demand for residential plots owing to availability of developable land and relatively lower plot values as compared to the city centre. North Chennai is anticipated to emerge as a forerunner in the forthcoming quarter, overshadowing its dearly priced counterparts. Number of enquiries for residential plots in the zone have increased Q-o-Q. 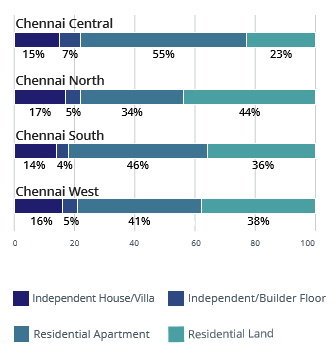 Chennai posted no movement in weighted average rental rates in the last one year. The peripheral areas, however, continued to gain traction owing to the availability of price-competitive rental stock. Some belts that recorded an upward rental graph include Pallavaram and Nanganallur, clocking appreciation to the tune of eight percent. Proximity to the International Airport and improved connectivity with East Coast Road and Old Mahabalipuram Road through radial roads acted as growth drivers. Among the upmarket localities, Raja Annamalaipuram garnered maximum average rental growth, standing at seven percent Y-o-Y. 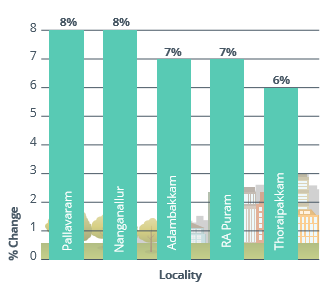 Thoraipakkam and Adambakkam registered an upward movement on account of proximity to IT and SEZ hubs. Rental demand from the student community and IT workforce led to the leasing values of builder floors in Chennai going north by two percent Y-o-Y. Lower maintenance costs associated with builder floors as compared to residential apartments magnetize the tenant community to this property type. 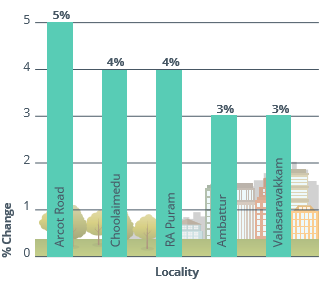 In line with the previous quarter, Ambattur led the market with a nine percent hike owing to affordability, presence of IT and ITeS hubs and proximity to the posh neighbourhood, Anna Nagar. 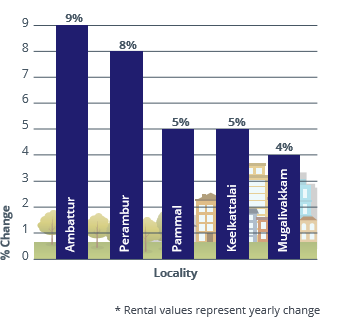 Perambur, Mugalivakkam and Pammal recorded a rental rise of four to eight percent in the last one year, primarily due to improved connectivity and easy accessibility to other housing and commercial pockets. The trend is expected to continue. The demand-supply dynamics in the city highlight its transition from the “flood-recovery” mode to a progressive state. Factors like reduction in new launches, shrinking of demand-supply gap and new construction along peripheral locations are contributing to this shift. Owing to the availability of developable land, North, South and West Chennai recorded maximum inventory for residential plots. Peripheral locations along OMR, Vandalur and GST Road witnessed a rise in the supply of plots in Apr-Jun 2016 against the previous quarter. 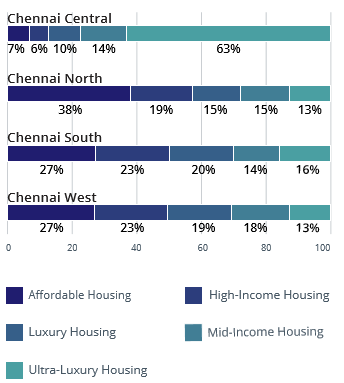 Central Chennai housed the maximum number of residential apartments with southern and western counterparts following suit. The city saw a fall of 36 percent in the number of new launches in H1 2016 as compared to H1 2015, implying a relief for the inventory pileup in the city. Demand and supply levels were evenly distributed across all budget categories. Affordable and mid-income housing categories were, however, comparatively more preferable against premium and ultra-luxury inventory. Mid-income housing (Rs 25-40 lakh) continued to be one of the most preferred and supplied segment. Availability of homes in this budget fell short of five percent, as compared to the demand at 27 percent. GST Road, OMR, Medavakkam and Tambaram recorded the maximum supply of properties in this price bracket. Supply surpassed demand by four percent in the affordable housing segment, highlighting the need of more such projects. 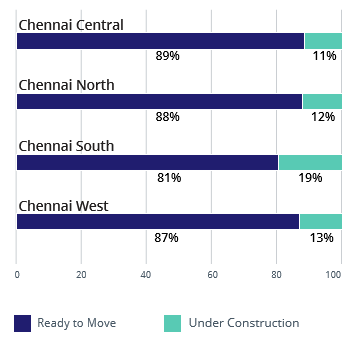 North Chennai recorded the maximum availability of units within Rs 25 lakh, followed by South and West Chennai. The rising preference for affordable and mid-housing stock is visible in the perceptible demand for 2BHK units in Chennai, which stand at almost 60 percent. Supply levels almost matched the demand at 55 percent. GST Road, Medavakkam, Tambaram and OMR topped the charts with respect to the supply of 2BHK units. The second favourite category was the 3BHK configuration, recording 22 per cent demand and 28 per cent supply. Central Chennai housed the maximum number of 3BHK units in the city, followed by South Chennai. There is a three percent dip in the popularity of 3BHK apartments in Apr-Jun 2016 compared to the previous quarter, as demand seems to have tilted towards 2BHK homes that reported a two percent jump. The 1BHK and 4BHK configurations were the least supplied and demanded units in the city. While North Chennai houses the maximum number of 1BHK units, Central Chennai posted the maximum supply of 4BHK units. 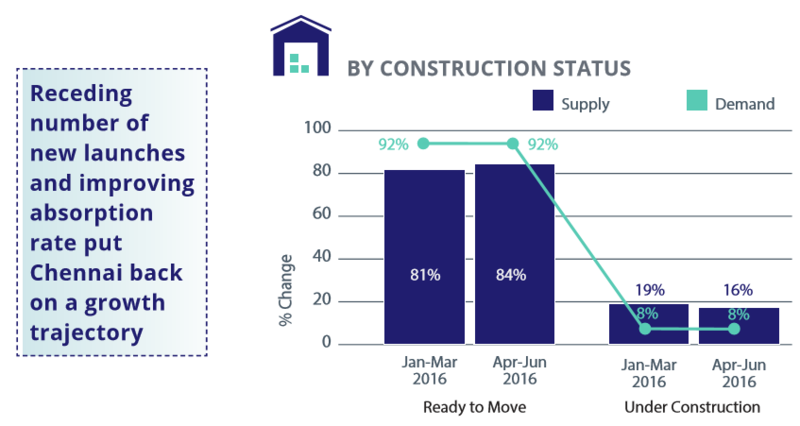 In keeping with the general trend across all realty markets, homebuyers largely preferred ready-to-move-in properties over under-construction in the light of stalled projects. The rising demand for ready units was met by a three percent jump in the supply of such properties across the city. GST Road, Medavakkam, Tambaram and OMR housed the maximum number of 3BHK units in the city. Popularity of these units is marked, with 92 percent demand in the first half of 2016. The misplaced confidence among end users for under-construction properties is highlighted in the low demand at 8 percent in Apr-Jun’16.